A long, forbidding, dark corner forms the first major break in the clifftop to the north of Laceration Jam. Your mission is to reach that corner and climb it. Start about 10' north of a right-facing corner and work up to a small bush. Forge boldly past a wide section (5.9) to the continuously difficult crack above. Wonderful climb, harder that it looks from the bottom. A crack climbing smorgasbord: body, hands and fingers. This is a very long pitch featuring exposed and sustained climbing up good flakes and corners. Highlights include sharp hand jams and encounters with rock tripe. -while we didn't experience a whole lot of tripe today, the rest is very accurate. IMO its more on the 5.10B-D range. Strong lead. This route is less than 200ft (around 170 to 180ft) so no worries with a 60m rope. 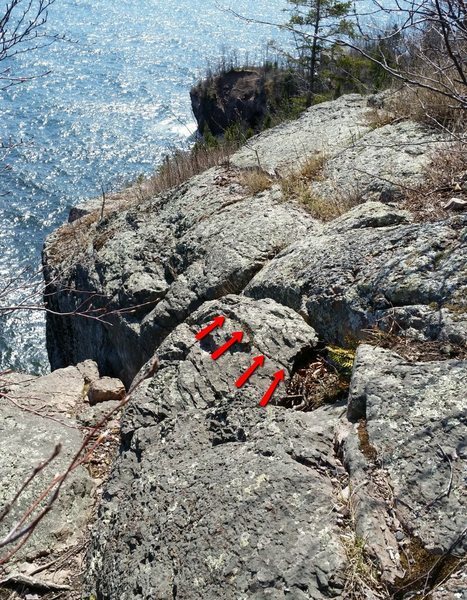 Red arrows indicate crack through the rock seemingly used as anchor for Scars and Tripes. Rock can be notably moved inwards when pressing on it. Caution using gear at this anchor point. April 25th 2015.